If you are seeking solace from the hectic everyday life, if you are sick and tired of the everyday monotony, we have the right therapy that you need. Rawla Narlai is a heritage resort situated right at the heart of nature in one of the iconic cities of India that is Udaipur. Rawla Narlai is a boutique hotel in Rajasthan which is one of the significant emblems of India’s past royal heritage. The luxury hotel is equipped with all the right amenities to give you a feel of home amidst the royal feel of the place. Rawla Narlai has always been voted as a topnotch luxury hotel because of its royal hospitality near Udaipur. It has been decades since the rule of the maharajas and the luxuriousness of the royal state of Rajasthan has diminished quite a bit but the dedicated staff has always been very keen to keep up the royal spirits of the place. This heritage resort speaks of the days gone by and the royalty of the state of the state of Rajasthan. At Rawla Narlai you get to feel the comfort of home at the royal environment of the best luxury hotel in Rajasthan. Our best spa facilities, luxurious poolside are the perfect things that you need to rewind and relax. All you need is a good massage from best of the in-house staffs at our spa which obviously comes with the royal feel that will make you feel like a mighty maharaja!!! Sit back and have a chat with your loved ones, play with your kids and have a lovely time with family at one of the best luxury hotels of Rajasthan. 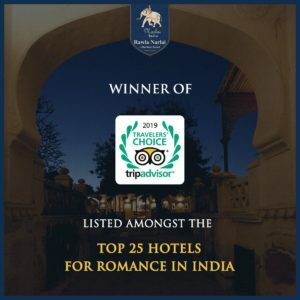 Rawla Narlai has also gained popularity because it has been one of the most loved and preferred boutique hotels for weddings, family events, social and cultural events etc. It has continuously been rated as the top luxury hotels because of the royal feel, the exquisite arrangement, and the breath-taking views. The impeccable architecture of the hotel is no less than a royal palace of the maharajas. Apart from the excellent accommodation facilities of the gorgeous Rawla Narlai the most tempting reason to go and explore this place is that it is one of the most loved weekend getaways in Rajasthan. Even if you are not having time for a long vacation, you can always drive up in this lovely luxurious boutique hotel to escape from the cacophony of city life and rewind and refill yourself with loads of energy and memories. So, don’t think anymore, come and explore this lovely boutique hotel in the lap of the iconic Udaipur.